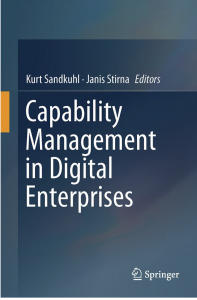 The CaaS project results have been published in a book on capability management. Putting capability management into practice requires both a solid theoretical foundation and realistic approaches. This book introduces a development methodology that integrates business and information system development and run-time adjustment based on the concept of capability by presenting the main findings of the CaaS project – the Capability-Driven Development (CDD) methodology, the architecture and components of the CDD environment, examples of real-world applications of CDD, and aspects of CDD usage for creating business value and new opportunities. Capability thinking characterizes an organizational mindset, putting capabilities at the center of the business model and information systems development. It is expected to help organizations and in particular digital enterprises to increase flexibility and agility in adapting to changes in their economic and regulatory environments. Capability management denotes the principles of how capability thinking should be implemented in an organization and the organizational means. This book is intended for anyone who wants to explore the opportunities for developing and managing context-dependent business capabilities and the supporting business services. It does not require a detailed understanding of specific development methods and tools, although some background knowledge and experience in information system development is advisable. The individual chapters have been written by leading researchers in the field of information systems development, enterprise modeling and capability management, as well as practitioners and industrial experts from these fields.